Apple and Charter Spectrum appear to have flipped the switch on zero sign-on functions for the Apple TV, even though a promised Spectrum cable app is still missing in action. The feature may require Spectrum subscribers to go into the Accounts menu in the tvOS Settings app and unlink/sign out of their TV provider then sign back in again, according to Gadget Whore. If it works, a new splash screen will pop up letting users know that they'll be automatically signed in whenever they're connected to their home Wi-Fi network. Zero sign-on allows people who get both their TV and internet access from the same company to be logged into tvOS apps with minimal effort, so long as an Apple TV detects it's on the right connection. It's a step up from single sign-on, which accomplishes much the same thing but requires people to manually enter credentials. 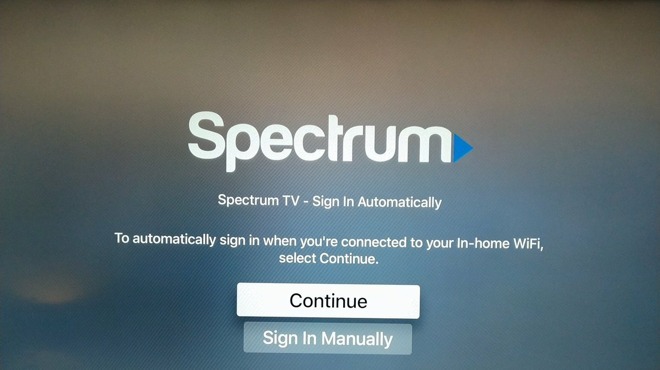 Spectrum is also planning to launch a live TV app to take advantage of zero sign-on, effectively turning an Apple TV into a cable box, but that now seems likely to arrive in 2019 instead of 2018 as promised. Earlier this week Apple altered its Apple TV 4K product page to mention Spectrum's rollout as "coming soon" rather than "later this year." Other TV providers enabling the Apple TV as a cable/satellite box replacement include France's Canal and Switzerland's Salt.